Today I've been working on another felt rabbit, this time for my granddaughter Eve's fourth birthday next Sunday. Eve told me last week she wants to be a ballerina. 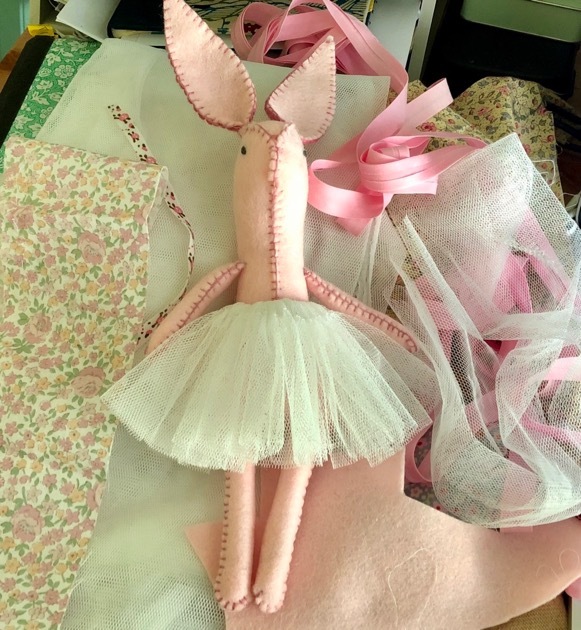 🙂 This rabbit is a ballerina and at the moment I'm sewing prototypes of ballet shoes. It's hard going because each shoe is only 20cm. 😳 I'm hoping to finish her tomorrow but I still have some knitting to do after the shoes. I thought it was a good time to ask how your aprons are coming along. Please add comments if you're having problems and one of us will help as much as we can. If you've finished your apron and you're on the sewing bee list, you can send a photo of your apron and I'll add it to a new Instagram gallery. If you want your apron recognised as yours, please add your name to the photo before you send it. I only have one photo so far. Please send only one photo. Don't forget, the deadline is next Monday, 22 April. I'm looking forward to seeing what you've done. Very cute Rhonda. Have you thought about knitting some ballet slippers and holding on with a stitch? Hi Jude. Yes, I have a pattern on standby but wanted to try this organic stretch fabric I have here first. I think I'll end up with the knitted shoes because the other is very fiddly. Hi Pam. My name at gmail.com. Thank you. What a lovely bunny and something your granddaughter will treasure. What a sweet little gift. I'm sure Eve will love it. Pink is the perfect color for a little ballerina. They have excellent ballet training in Australia. Lovely work. Thank you Stephanie. You're our dance expert so I was hoping you'd like it. This is so sweet Rhonda! Makes me smile just to look at it. Your granddaughter has a special Grandmother (or Grandmom in my household) and I know she will have fond memories of you and the bunny you made for her. I bought a 100% cotton king size doona cover at the op shop the other day to make a few aprons. I think they will end up costing about 80c each so pretty chuffed. Cutting out today (been down with migraines too many days lately) and hopefully sew some tomorrow. Your rabbit ballerina is adorable! I’m going to be late to the sewing bee unfortunately. I’ll still make an apron but it won’t be in time. We are still building here my sewing machine remains tucked away. 🙄 I’m itching to get sewing and creating again. Barb, that's exactly what I did. I ended up using felt for the shoes, hand stitched them and then cut the excess felt off. It worked perfectly. Thanks. I gave the rabbit to Eve when she arrived yesterday and she loved it. I'm almost ready to send my apron email! I'm not quite done but I have to clarify your email. Is it Rhonda or Rhonda Jean or your full last name? I know the rest of it but the first part I'm unsure about. It's my first and last name, Alice - with no spaces. Apron is coming along just fine, Rhonda. I am not on the Sewing Bee list. Do you want a picture anyway? It was great fun to make and I plan to do another. Yes Hopflower, send your photo.